From the chill in the air to the deep, dark nights, one thing is clear – Halloween is almost here! 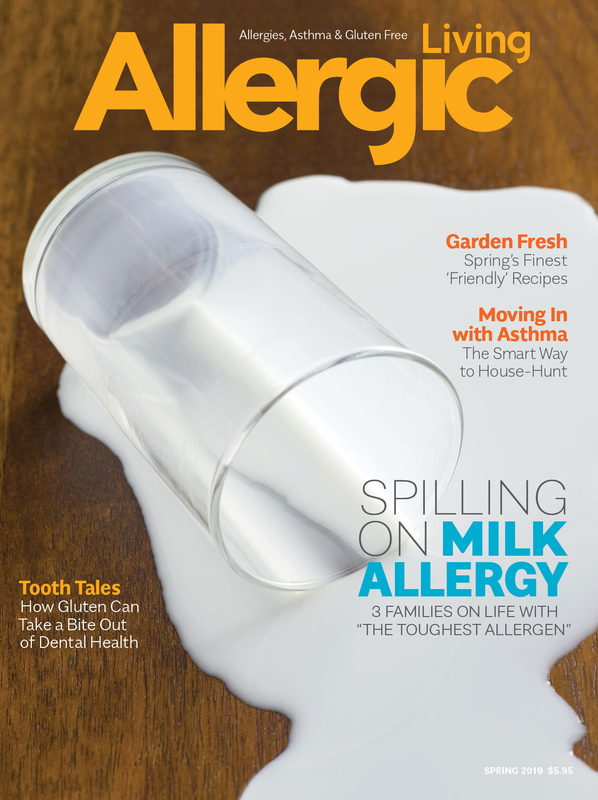 Allergic Living has pulled together our annual list of thrilling, allergy-friendly treats sure to impress whoever’s lurking outside the door. 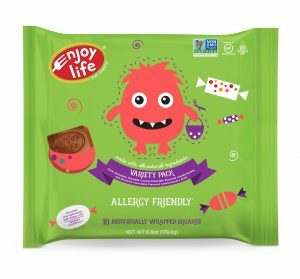 Give trick-or-treaters what they really want with allergy-friendly chocolate minis from Enjoy Life Foods. Available in dark, rice milk and rice milk crunch, these smooth, creamy treats deliver pure chocolate joy. This brand’s bars and squares have swiftly become a lunch box go-to. 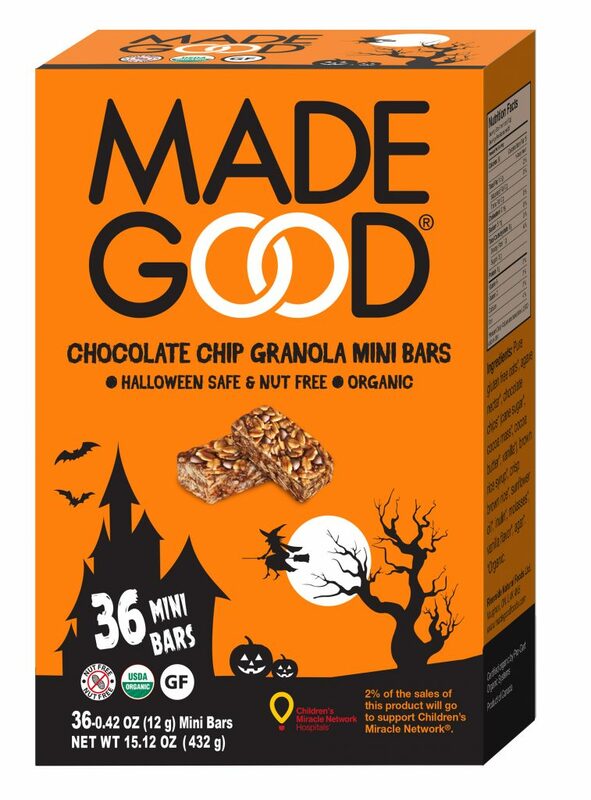 And now for Halloween, Made Good’s Chocolate Chip Granola Mini Bars are dressed up and ready to party! Delicious and healthy? Just don’t tell the kids that the trick is on them! Available at major U.S. retailers such as CVS, Whole Foods or via Amazon.com. (U.S. & Canada). 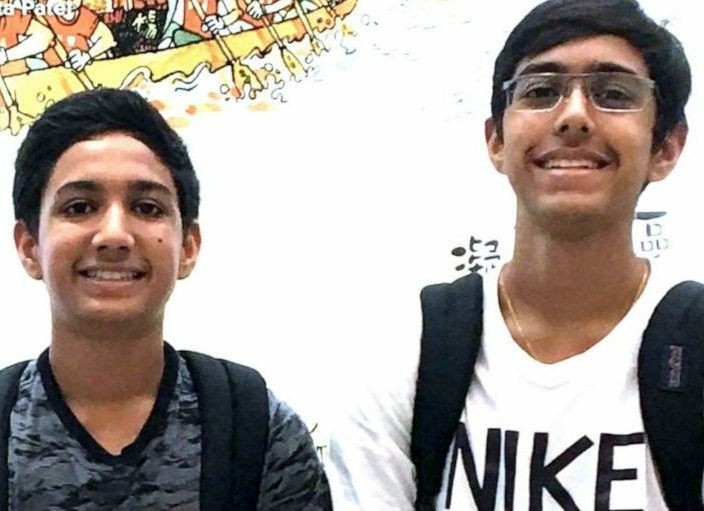 In Canada, at Loblaws, Costco and Metro. Prep for a holiday that screams for chocolate with a visit to Vermont Nut Free for oodles of creamy, luscious treats. Ghoulish gift packs, brimming with seasonal sweets make special gifts for your little ones. For those expecting trick-or-treaters, individually wrapped Halloween pops and foil-wrapped miniatures make perfect handouts. 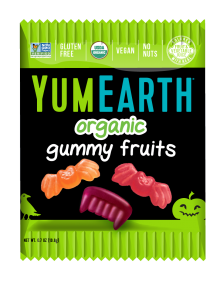 Curb any young Dracula’s cravings for blood with YumEarth’s organic gummy fruit bats and fangs – a somewhat familiar favorite for any vampire to enjoy. Throw in some Halloween lollipops in strawberry, mango, cherry and watermelon and you might change the undead’s blood-sucking ways for good. Both available in variety packs. 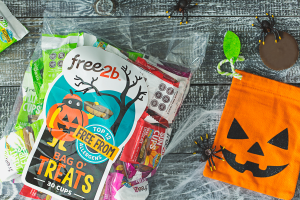 Treat costumed kids at the door with free2b’s Bag O’ Treats variety bag, which includes individually wrapped Dark Chocolate, Rice Chocolate and Mint Cups. All goodies are free of the top 8 allergens and more. 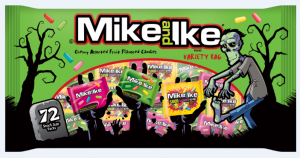 With 72 snack size packs per variety bag, Mike and Ike has got your free-from needs covered for Halloween. But be warned; these tempting, chewy candies in sour, tropical and original flavors won’t last long! Impress world-weary vampires and blasé Batmans with No Whey! 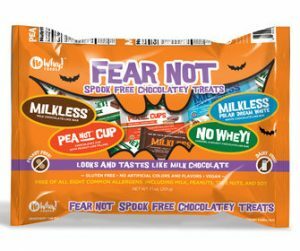 Foods’ new Fear Not – Spook Free Chocolate Treats sampler pack. With a choice of Milkless Milk and Polar Dream White bars, Pea ‘Not’ Cups and No Whey! Caramel and Nougat bars, you’ll wow even the most jaded of Jedis. You may not normally hand out delectably soft and cakey brownies for Halloween, but it’s time to break the rules! 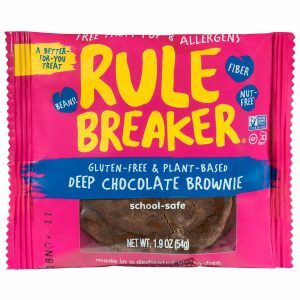 In four tempting flavors, including deep chocolate brownie and birthday cake blondie, Rule Breaker Snacks make it easy, and safe, to add baked goods to your Halloween-handout rotation. 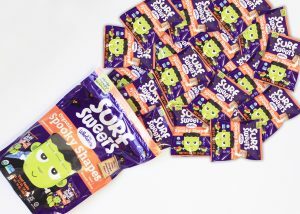 Add some great ghoulishness to Halloween treat bags with Surf Sweets’ updated Spooky Shapes gummies. 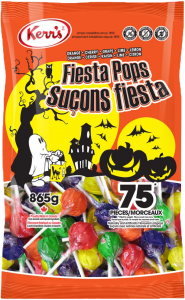 The not-too-scary spiders, skulls, pumpkins and witches’ hats come in all-natural cherry, lemon, orange and strawberry flavors, and, as always, are free of the Top 8 allergens plus sesame and sulfites. 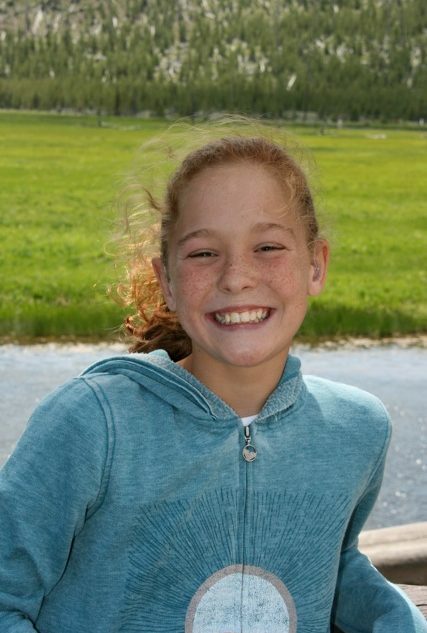 Available at major U.S. retailers such as National Grocers and Target, and via Wholesomesweet.com. (U.S. & Canada). In Canada, find at Bulk Barn and Loblaws. A handful of Wholesome’s Wicked Watermelon and Eerie Orange lollipops is bound to make any trick-or-treater’s night. 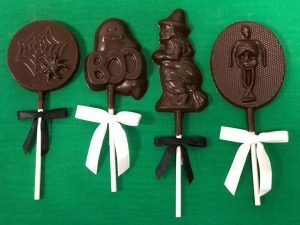 Free of artificial colors, flavors, these ghost- and skull-shaped pops are a free-from delight for adults and children alike. Free of: Top 8 allergens and gluten. Made on a separate floor of a facility that also processes dairy, eggs, soy and wheat. Available at Wholesomesweet.com (U.S. & Canada). In Canada, at Bulk Barn. 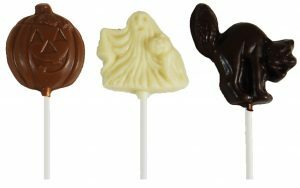 Excite the neighborhood crew with chocolate lollipops in spooky witch, skeleton, spider and ghost shapes. Or go for Teal Ghost Bags filled with nine individually wrapped chocolates. Created in partnership with FAACT (Food Allergy & Anaphylaxis Connection Team), they’re the perfect complement to a teal Halloween. Like a startling fright, a sugar high is part of the fun of Halloween night. 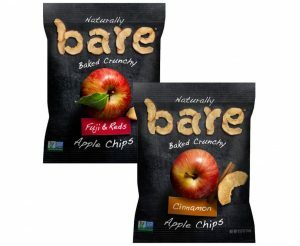 But break the saccharine spell with a little loot bag balance when you shell out bare’s Fuji & Reds and Cinnamon Apple Chips. The naturally sweet chips are also a convenient on-the-go snack. Bare’s variety snack pack provides 24 bags of crunchy snacking perfection. You’ve got the costumes, the décor, the music and the snacks. All that’s missing are colorful Fiesta Pops from Kerr’s to really get the party started! With 75 fruity pops per variety bag, the one thing you won’t have to fear is running out. Free of: Top 8 allergens, sesame and gluten. Processed in a facility that occasionally processes foods with dairy, soy and sulphites.